Based on driving conditions, the Intelligent Torque Controlled Coupling (ITCC) at the heart of the Tucson’s available All Wheel Drive (AWD) system adjusts torque distribution at the push of a button and allows for a 50/50 torque split between front and rear wheels, for better handling and mileage. With increased traction and standard 18-inch wheels on the Limited, the Tucson takes on mud and snow with assurance. With up to an EPA-estimated 29 MPG Highway,* it’s not just the engine that makes Tucson a more efficient vehicle. Active ECO System technology provides improvement in real-world fuel economy. ** And every Tucson features an Overdrive Lock-up Torque Converter for more efficient fuel economy at highway speeds. The 6-speed automatic gives you the best of both worlds. You’ll have an automatic to deal with city traffic and the SHIFTRONIC® manual shift mode for when you feel the urge to take control. The Tucson GLS 2.0L 4-cylinder engine gets up to an EPA-estimated 29 MPG Highway. * The SE and Limited’s 2.4L GDI engine steps up the horsepower to 182 and still delivers an EPA-estimated 28 MPG Highway. Engines that give you more horsepower and MPG are the key to providing you with a more fuel-efficient crossover. 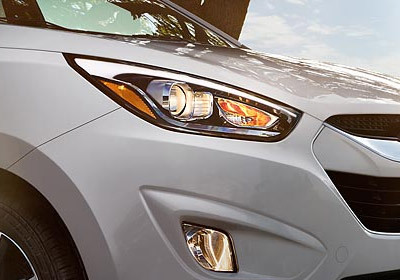 The Tucson features front and rear exterior lighting that enhances its design and adds to your visibility. A brilliant combination of standard projector headlights with LED accents and available LED tail lights. Once you're in the Tucson, look up—all you'll see is open sky. 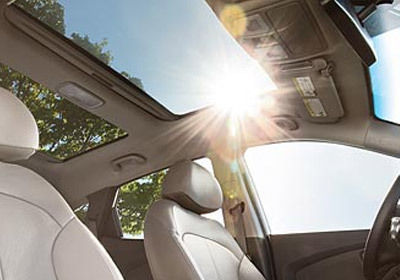 The available panoramic sunroof extends from the front seats to the back, bringing in light, fresh air and bliss. Whatever the weather, hot or cold, Tucson offers features that protect you from the elements and even the paparazzi. Front solar glass keeps the glaring sun at bay while the rear privacy glass keeps wandering eyes from intruding. 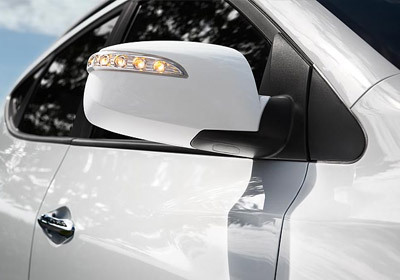 When the air turns frosty you’ll appreciate heated side mirrors with turn-signal indicators,* all done up to match the color of your vehicle. The eyes have it. Available chrome-accented door handles and grille create added visual highlights. 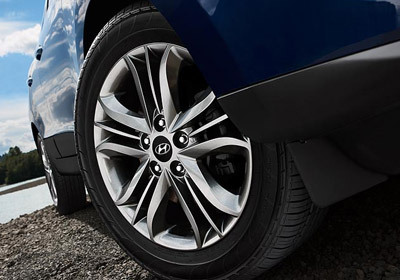 The standard 17-inch alloy wheels and available 18-inch alloys were both designed to complement the Tucson’s sleek, European-inspired exterior. Generous space and comfort are not exclusive to just those in the front seats. Tucson has more rear leg room than the Honda CR-V, Nissan Rogue, Toyota RAV4 and Ford Escape. * And thoughtful touches such as new two-stage reclining rear seats and available rear-seat heating and air conditioning vents are sure to please second-row passengers. There's a sweet spot for every Tucson driver with a driver seat that can be configured 6 ways (available power 8-way). The available leather-appointed passenger cabin with heated front seats and dual-automatic climate control, maximizes comfort no matter how long or short your drive. Not only does the Tucson have more passenger volume than comparable vehicles, such as the Ford Escape,* it deploys all this extra space far more thoughtfully. So even when you’re not hauling big stuff, there’s a place for everything. In addition to new illuminated cupholders, convenient map pockets and bottle holders are integrated into door panels. There’s a center armrest compartment and even a convenient storage tray for the rear cargo area. There’s even a retractable hook on the rear seatback to keep shopping bags in place. The standard integrated Bluetooth® hands-free phone system lets you take calls and stream audio, without taking your hands off the wheel. There’s also a 4.3-inch color touchscreen with audio and rearview camera. At the top of the tech wish list is the 7-inch color touchscreen navigation system with a rearview camera, and NavTraffic,* which provides real-time road conditions that’ll help you avoid traffic jams and give a clear picture of alternative routes. The Tucson is equipped with active front head restraints, for protection against whiplash. These restraints use body weight to react in a rear-end collision, making them simple, yet extremely reliable. Traction Control System (TCS) works to reduce skidding, maintain traction and reduce wheelspin in various adverse traction conditions, like inclement weather. TCS helps provide more stable and predictable acceleration characteristics for a more confident, controlled driving experience.